Blazing Saddles Bike The Bridge! 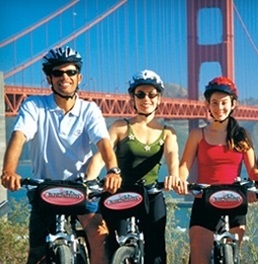 Blazing Saddles Bike Rentals and Tours, a family owned and operated company, started in San Francisco’s Fisherman’s Wharf over 30 years ago with a single idea: to share the unforgettable experience of biking over the Golden Gate Bridge. Since then, Blazing Saddles has been the leader in providing groups and individuals a fun and unique sightseeing experience. With locations in San Francisco, Monterey, and New York – from Central Park to Golden Gate Park – we’ve got you covered coast-to-coast. Blazing Saddles has the friendly, knowledgeable staff and the perfect bikes to get you ready to roll on the ride of a lifetime! What Hills? 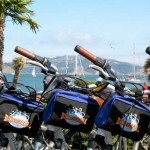 Ride over the Golden Gate Bridge to Sausalito/Tiburon, Return via Ferry, or Tour the City. Ask Blazing Saddles headquarters for the best trails to ride in the Bay Area! Discount not valid without printed coupon. Present coupon at any of our bike rental locations. 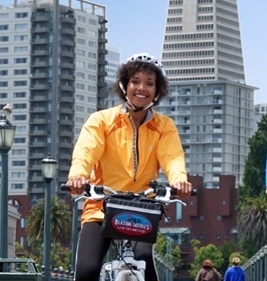 Bike The Bridge and Return Via Ferry! Get rolling on the ride of a lifetime! Ride along the car-free National Park Bike Path from Fisherman’s Wharf to the Golden Gate Bridge. Cross the world-famous bridge on the sidewalk and enjoy breathtaking views before coasting downhill to charming Sausalito. 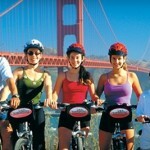 Relax and enjoy this picturesque bayside town, then you and your bicycle return to San Francisco on the ferry. Ask Blazing Saddles for the best trails to ride in the Bay Area! Present coupon at any of our bike rental locations. Discount not valid without printed coupon.